IPS Group were the first to install Rubberfuse TPO flat roofing systems into the UK. This dynamic roofing solution is not only durable, but better for the environment too – and offers excellent value for your business. IPS Group are proud to say that we were the first to introduce Rubberfuse TPO flat roofing technology to the UK. To this day, it still remains one of the most effective flat roofing systems available, and it offers a number of benefits for your business. The introduction of uncured ethylene propylene rubber into a propylene matrix, and the incorporation of several layers into the overall design, ensures a durable, flexible, long-lasting roofing system for your company premises. 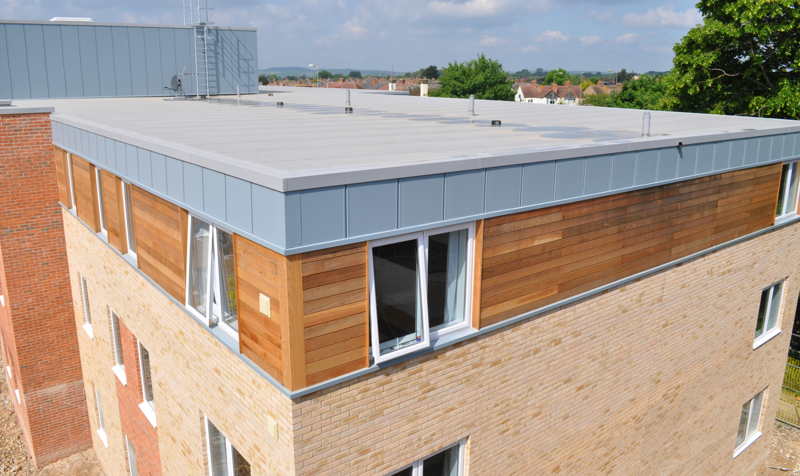 Our flat roofing systems are manufactured using several specialised layers of varying thicknesses, giving it the perfect blend of resilience and flexibility. They also come with a 30-year available guarantee. IPS Group are proud to be partnered with Stirling Lloyd; a global leader in waterproofing and structural membranes for roofs; and Triflex – leading European specialists in surfacing and repair systems. Our flat roofing systems are well suited for forward-thinking businesses – who are concerned with using environmentally-friendly materials within their premises. Flat roofing is an appealing choice for any business, regardless of the size or location of your premises. Here’s an overview of the main benefits. Thanks to the flexible design of the Rubberfuse TPO flat roofing system, even complicated roofing areas can be covered. Our knowledge of structural waterproofing ensures that all roofing is watertight, regardless of the complexity of the project. IPS Group’s flat roofs come in a wide variety of colours and finishes for additional aesthetic appeal. They can be matched to your existing premises or combined with cladding to create a dynamic appearance for your company. If you’d like to find out more about the Rubberfuse TPO flat roofing system, or want to arrange a free consultation to discuss your needs further, simply get in touch with the IPS Group team today.